As the insurance industry continues to become more competitive with online marketing and services, custom web design for insurance companies will continue to drive success. Insurance agencies are entering the online marketing world at full force. Perhaps a little later to the party, but better late than never. Over the last year, our Toronto web design company has noticed a significant increase in insurance company website design RFPs. Given the natural and highly competitive nature of the insurance industry, the need for professional insurance website design is higher than ever. 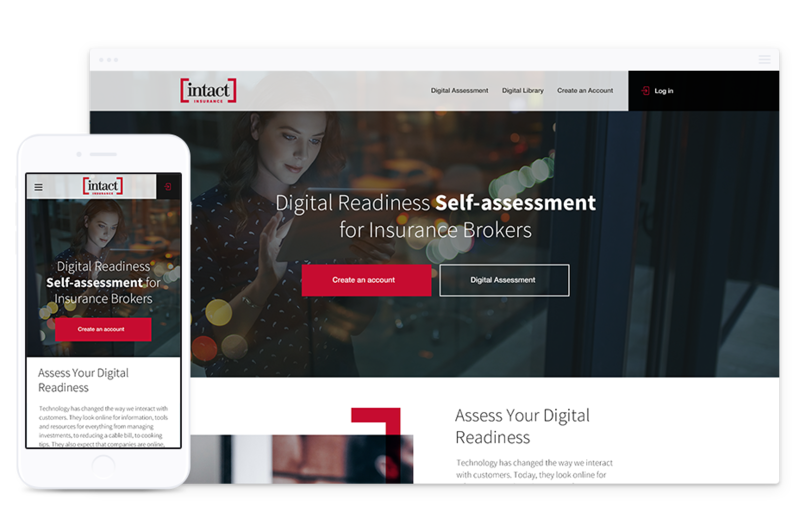 Many of the key players in the insurance industry have now gone to market with highly interactive website solutions focused on converting potential clients via social media and digital self-service options. Given this surge in what has traditionally been a rather quiet industry regarding website design and online marketing, our team of professional website designers and web developers created a list of best practices to follow when undertaking insurance agency website design and development. For a visual tour of our recent web design for insurance companies, we invite you to a behind the scenes tour at our brand new Navigators Insurance website design case study. For a more in-depth understanding of our approach to website design and digital marketing for insurance agencies, please continue reading. Creating professional website design for business-to-consumer industries is unique in many ways. Tackling website design for insurance companies is even more unique in that we all need insurance and we all invest a lot of money with insurance brokers. The amount of money we spend each year on insurance products and services alone requires a great deal of consumer confidence. This confidence is born almost instantly when we visit an insurance company online through highly professional, polished website design. The first impression a new visitor experiences with the agency’s brand is the first and most crucial step in the journey from prospect to customer. Every business is obsessed with search engine optimisation and rightly so. Insurance companies are no different and potentially more aware and competitive than other industries given the nature of the insurance world. Because of the relationship between the insurance providers and insurance agents or brokers, many web users are not aware of insurance brands or search for a specific insurance company. This uncertainty creates a unique opportunity for insurance companies to be more aggressive in their search engine optimization strategies and online marketing. Creating website designs for insurance companies that are highly optimized is fundamental for us as web designers. Through our extensive web analytics research, we have found that insurance company websites see a primary focus on product and service pages. When creating our website design strategy, we emphasise both passive and aggressive calls to action to help funnel web users directly to the product or service page of most interest to them. Once we have our captive audience on the insurance service pages, we can then begin our lead conversion strategy to convert users into customers by way of online insurance quote forms. Following our research into how web users interact with insurance companies websites we also discovered a trend indicating the need to make customer service and contact information clear and accessible. Following the drive to the service pages, most users returned to the insurance websites to make further inquiries or speak directly to an insurance agent. Understanding this user trend, our Toronto web designers focus on creating a highly focused navigation to open clear paths to insurance service pages and customer service within our website design for insurance companies. Photography can make or break any website, but we believe that insurance company web design should focus on a particular type of photography. The very core of all online marketing strategies for insurance agencies is sales. Taking inspiration from the fundamental nature of insurance sales, our web designers focus on lifestyle photography. When it all boils down, what insurance companies are selling is peace of mind allowing us all to focus on our day-to-day lives knowing our family and property is safe and adequately funded. Using lifestyle imagery throughout any web design for an insurance company reaffirms this emotional need for us all and helps convert leads into customers. Offering a mobile-friendly website design is paramount for all insurance companies. As the industry continues to evolve and expand online, insurance companies that provide a seamless mobile friendly and genuinely responsive website experience throughout all product and service pages will out-perform those that do not. To further discuss our best practices for insurance company website design, please call our Toronto web design company at 416-901-8633. To request a formal proposal for your insurance company website design, please review and submit our online quote request form. Need a Web Design Quote for Your Insurance Company? Creating a website design that delivers results can be a challenge without a professional web design company. Let us help you plan and execute your next website project.